CAUCASIAN COSSACKS AT THE WILD WEST. THE West End of London overrun by a horde of wild Caucasian Cossacks offers a picture almost as startling as that of the New Zealander perched on a broken arch of London Bridge and moralising over the ruins of the mighty modern Babylon. Though, by the favour of Mr. Gladstone, the wild Irish, the dynamiters, and the anarchists, London is not yet so far advanced on the downward path, there is a foreshadowing of such a doom in the presence of a troop of Cossacks, from the Don of elsewhere, astonishing the visitors to the Horticulturies by their feats of horsemanship at the Wild West. They are but ten in number, it is true, but their "show" is remarkably effective. 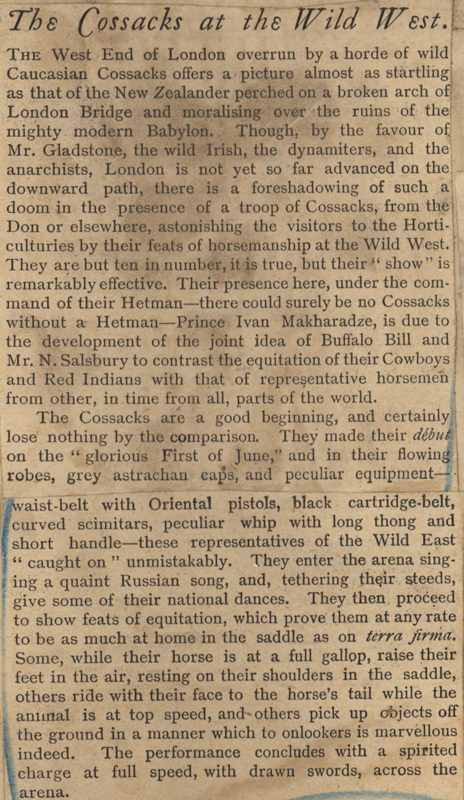 Their presence here, under the command of their Hetman—there could surely be no Cossacks without a Hetman—Prince Ivan Makharadze, is due to the development of the joint idea of Buffalo Bill and Mr. N. Salsbury to contrast the equitation of their Cowboys and Red Indians with that of representative horsemen from other, in time from all, parts of the world. The Cossacks are a good beginning, and certainly lose nothing by the comparison. 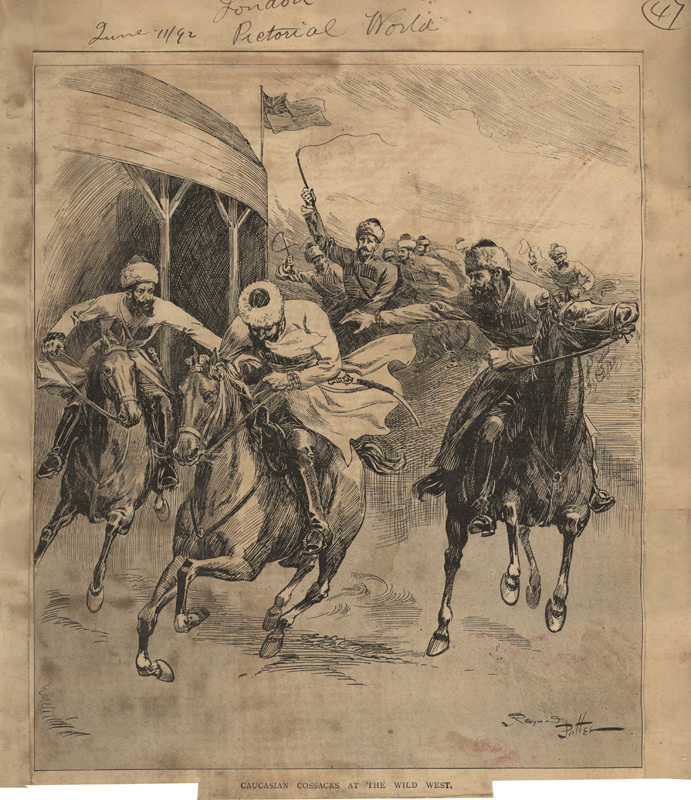 They made their début on the "glorious First of June," and in their flowing robes, grey astrachan caps, and peculiar equipment—waist-belt with Oriental pistols, black cartridge-belt, curved scimitars, peculiar whip with long thong and short handle—these representatives of the Wild East "caught on" unmistakably. They enter the arena singing a quaint Russian song, and, tethering their steeds, give some of their national dances. They then proceed to show feats of equitation, which prove them at any rate to be as much at home in the saddle as on terra firma. 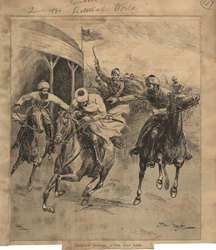 Some, while their horse is at full gallop, raise their feet in the air, resting on their shoulders in the saddle, others ride with their face to the horse's tail while the animal is at top speed, and others pick up objects off the ground in a manner which to onlookers is marvellous indeed. The performance concludes with a spirited charge at full speed, with drawn swords, across the arena.